Hampered by heavy-fueled forests, high winds, and low humidity for several weeks, the American fire near Foresthill, California, which started on August 10, 2013 in the American River Ranger District of the Tahoe National Forest, (cause under investigation), was declared 100% contained on August 29th, but not before damaging both the Swinging Bridge and a smaller footbridge on the Tevis Cup/Western States trail. As soon as safety permits, qualified personnel will inspect the bridges to determine their foundational integrity and identify repairs needed before the public can safely use these structures. With the Labor Day Holiday weekend upon us, Forest visitors are urged to comply with area and road closures. 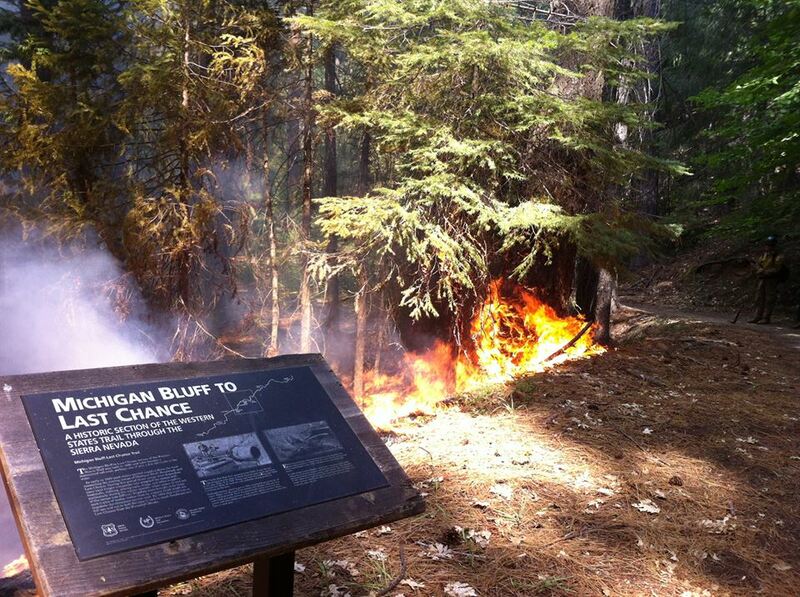 These closures are in place to protect visitors and fire fighters. The closed roads and areas are unsafe due to several factors including: fire-weakened, burned trees that pose a risk of falling; burning holes in the ground from tree roots and stumps; and heavy smoke making visibility extremely poor. These areas and roads will continue to be re-evaluated and will be re-opened as soon as possible. Every equestrian has a favorite trail. Just thinking about riding there brings you a feeling of peace, of being close to nature and closer to your equine friend. In celebration of trails, the nation’s leading sport in encouraging the use, protection and development of equestrian trails – the American Endurance Ride Conference (AERC) – is announcing a “My Favorite Trail” essay contest. The top three entries will be awarded gift certificates from contest sponsor Riding Warehouse, www.ridingwarehouse.com, with $250 in gift certificates going to the first place entry, $150 for second and $100 for third. The top prize winner will also receive a free one-year membership to the American Endurance Ride Conference, the nonprofit distance riding organization. In 500 words or less, simply describe a favorite trail or trail system where you love to ride. Have you had an incredible wildlife encounter, an “ah-ha” moment with your horse when you conquered a particular challenge or just love the beautiful scenery? Send your entry by November 30, 2013, to endurancenews@foothill.net or by mail to AERC, Attn: Trail Contest, PO Box 6027, Auburn, CA 95604. You are welcome to include one photo if you wish. Please include your name and contact information. AERC’s Trails and Land Management Committee members will choose the top three winners, based on the most heartfelt write-ups. Those essays, and runner-up essays, will be published by AERC in the monthly Endurance News magazine or the quarterly online newsletter, AERC Extra. With rides ranging from 25 to 100 miles in a day, endurance riders are lucky enough to experience trails in all their glory as they train and compete. They would love to welcome new riders and their horses into the sport to share joy of riding trails, both new and historic. To find out more about the sport of endurance riding, visit www.aerc.org. Part of AERC’s mission is to fund trail projects that not only make trail improvements for endurance rides, but for all who use the trail systems. Each year thousands of dollars contributed by endurance riders are given to trail grant applicants. The organization also hosts Trail Master classes to teach sustainable trail building, maintenance and repair skills to trail workers around the country. The contest is open to all. The winner will be announced in mid-December, 2013. Complete rules are available at www.aerc.org/TrailsContestRules_2013.pdf. The 50-mile course, and the first 50 miles of the 100-mile course, for the 2013 Vettec AERC National Championships that will be held on September 20 and 22 near Almo, Idaho, is a hit. Day 5 of the City of Rocks Pioneer Trails Endurance ride held on August 6-10 was a test ride for the National Championships. "It's absolutely beautiful!" 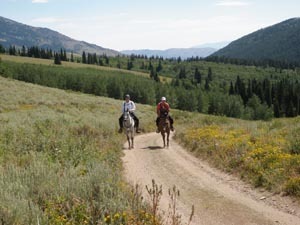 exclaimed Heidi Skerratt, riding Gold N Beaudayshus at 8500', the highest elevation on the trail. "I could ride this trail every day and not get tired of it!" Many riders echoed that sentiment at the splendid scenery that followed them with every foot in elevation gain throughout the ride. It will be a challenging 50 mile trail: horses begin at 5318' at base camp outside the spectacularly scenic, geologic, and historic City of Rocks National Reserve, and climb to 8513', with a total elevation gain/loss of approximately 6500'. Trails will take riders over the historic California Trail, the Salt Lake Cutoff Trail, and Boise-Kelton Stage Routes, through the National Reserve and up into the Albion mountains in the Sawtooth National Forest. 38 of 42 riders completed this 50-mile trail, with the winning time 5:25. When Ragan Kelly returns to school at Vanguard this week, she could show off a pretty nifty belt buckle if she wished. It’s not one that the 12-year-old picked up at the Gap or Cavender’s, either. She earned it. She’s got the callouses and sore muscles to prove it. The buckle carries the message “100 Miles, One Day,” and it’s emblazoned with a picture of a pony express rider. To receive it, one must finish the Tevis Cup, which has been called the nation’s most grueling equine endurance ride. Back in late July, Ragan and her mother Tracy, a Waco veterinarian, accomplished just that. They had to endure scorching temperatures, rugged terrain and even rattlesnakes along a 100-mile ride through the Sierra Nevada mountain range from Squaw Valley in Lake Tahoe, Nev., to Auburn, Calif.
And to get credit for the finish, they had to do it all in a single day. Come in over 24 hours, and it doesn’t count. Competition is a prime focus for endurance rider Meg Sleeper, but she didn't go to France last week to win; she went to scout. The Frenchtown resident was aboard a borrowed horse, Tikis Twistyr, for the 2014 Alltech FEI World Equestrian Games' test event, run against the scenic background of rugged Mont Saint-Michel, verdant fields and broad beaches in Normandy. She was among 58 riders from 35 countries who toured the 129.3-kilometer course. Unfortunately, her mount was "sort of a longshot" and wasn't at optimum fitness. She got pulled at the end of the ride (the condition of the horses is checked periodically along the route and after the finish). A ribbon wasn't the mission,though. Sleeper, a veteran of five world championships who is a candidate for the U.S. WEG team, was there to scope out the conditions. AERC has more to offer than just competitions. The trail grant program is one that all trail users profit from and yet we hear very little about them. Two grants were approved at the midyear meeting. One was a grant for $3,870, which will be used in Horseshoe Bend Park in Frenchtown, New Jersey. The funds (which also have matching funding) will be used to lay down geo textile fabric and gravel in low lying areas and for trail marking. This trail will connect two parks making for several miles of trail when completed. In the near future, maybe as early as 2014, the people in the area plan to host an endurance ride. There is an Endurance Clinic being hosted at the park by Meg Sleeper on September 28, 2013. The endurance riders in the area will be doing a lot of the work on this multi use trail system but all trail riders will be able to enjoy their effort and hard work. The other trail grant that was approved was for $846.00 in the Capitol Forest near Olympia, Washington. The funds will be used for gravel and geo textile. This improvement will help in making the trails sustainable for the multi use system that the bare Bones Endurance Ride uses. Much of the work will be completed by the horse users in the area. Let's get the word out that AERC currently has about $55,000 in the trail grant funds to help you with building sustainable trails or trail maintenance. AERC has spent a lot of funds on campgrounds that host endurance rides. The AERC Board of Directors met on August 17 at their mid-year meeting. Two motions garnering a significant amount of attention and controversy were on the agenda. The first motion provides for an option in recognizing personal mileage plateaus. This will allow members to purchase a jacket indicating AERC miles after attaining an initial plateau of 1,000 miles and at 1,000 mile increments thereafter. Mileage can be endurance miles, limited distance miles or, if riders elect to add their limited distance and endurance miles together, will be indicated as "AERC Miles". This motion does NOT combine mileage in any way except for the individual's preference for acknowledging a personal milestone on their jacket. This motion was passed by a significant majority. The second motion changes rule L7, which addresses Best Condition judging in LD rides. The motion requires that Limited Distance rides have a BC award available; and that the same judging system used in the endurance division be used for judging LD Best Condition. The motion passed 16-4. While Board members believe that ride managers should have autonomy when managing their rides, the majority felt that since AERC offers a regional BC award, that in the interest of fairness and a level playing field, uniform BC judging should occur at all sanctioned rides. Libby Llop, a local endurance rider, trains with her horse May Fly for a recent competition. Local endurance rider Libby Llop had a great time at a 50-mile ride in Rhode Island on Aug. 11. It was only the second American Endurance Ride Conference sanctioned ride for her young mount May Fly who is 5 years old this year, the youngest that horses are allowed to compete at that distance. May Fly is half sister to Llop’s mare Fly So Free, with which Llop has seen much success in recent years, logging more than 3,000 miles in competition. Both are out of an Arabian mare, I Juana Fly, that Llop acquired a few years back. This younger mare is an Hispano Arabe by Llop’s Andalusian stallion Dakota Galano. The 14-year-old stallion is owned by Beth Snyder who is showing in dressage with Lucretia Galbraith as her trainer/coach. The Distance Riding Association of Wisconsin will host a new horseback riding event Aug. 24-25 on the Dugan Run Horse Trails, about eight miles west of Stone Lake, off Highway 70. Two types of distance rides, endurance and competitive trail rides, will be held. Endurance rides are horseback rides of 50 to 100 miles that are the equivalent of human marathon races. A 50-mile ride must be completed within 12 hours; a 75-mile ride must be completed in 18 hours; and a 100-mile ride must be completed in 24 hours. The winner is the first horse-rider team that crosses the finish line. Limited distance rides, another type of endurance ride, are limited in distance to between 25 and 35 miles. The winner is the first horse-rider team that crosses the finish line first and whose horse’s heart rate falls to 60 beats per minute or less. On Sunday, Aug. 25, there will be a 12-mile Novice Ride for riders just learning about the sport of distance riding. For more information, contact Bill Suskey, ride manager, at (414) 301-2455 or bill@hellsbellsfarm.com, or T.J. Edwards at (715) 635-6789 or rabbit_sheriff@hotmail.com. AERC recognizes that the junior riders are the future of the sport, and will be providing a rebate to all starting Junior riders. $500 will be shared equally among the juniors, and a rebate check will be issued to them afer the event. Hammer Nutrition is proud to be the nutritional sponsor for the riders in the American Endurance National Championships! Hammer Nutrition has everything you need when it comes to the highest quality fuels and supplements, as well as unmatched customer service and technical support. You’ll save time and money, and you’ll feel secure knowing that one company has all your fuel, supplement, and technical support needs covered, which means you can ride with complete confidence! HOUSTON -- For six and a half grueling days earlier this month, Devan Horn, a 20-year-old college student from Sam Houston State University, was the best endurance horse rider in the world. But even though she crossed the finish line first after 700 brutal miles across the Mongolian wilderness, judges gave her second. Horn traveled alone to the Mongolian steppe to take part in what is advertised as the longest, toughest horse race in the world. Participants ride a series of semi-wild Mongolian ponies, a new horse every 25 miles, through a network of horse stations recreating Genghis Khan’s legendary postal system. Horn, who works and trains at Cypress Trails Equestrian Center in north Harris County, was in awe of the scenery and the vast expanse of the Mongolian wilderness. From the very beginning, following the advice of her coach Justin Nelzen who won this race in 2010, she raced into the lead a full 25 miles ahead of the other 29 riders at the end of the first day. A lead she held until day five, which she admits was her worst day of the journey. It started with a horse kicking her in the pelvis. "I got kicked and I flew pretty far and all the Mongolian children were just laughing at me,” Horn said. Then during that leg of the race her horse bucked her off and ran away, not an uncommon experience with the Mongolian ponies they are required to use. "So that was my worst day in the derby,” Horn said. “I got kicked, bucked off, and sick all in a 12-hour period." After six and a half days, Horn crossed the finish line first. She’d done it on her 25th horse, one that a Mongolian herdsman recommended as his best horse at the final horse station. It was an honor she couldn’t refuse. "I was so proud of myself for finishing,” Horn said. “It was an amazing experience." But each of the 25 horses each rider uses during the course of the race must pass a veterinary inspection to see if the riders have pushed them too hard. Race veterinarians wait an hour after the finish of each leg to take the resting heart race of each horse. Horn’s final horse, the one she was honored to receive from the Mongolian herdsman, never reached a resting heart rate fitting with the race rules. Horn said the horse had a respiratory infection and its pulse rate would not come down within the acceptable range, but rules are rules and she had to accept them. She was give a two-hour penalty and given second place. First place went to Britain Lara Prior-Palmer who had finished an hour behind. “I'm going to say it was about ten minutes of crying before I realized I had battled windstorms and terrain and sand dunes and wild horses and you know a thousand kilometers of trouble to get here,” Horn said. “And I wasn't going to be defeated by a chest cold." “But considering what else could have gone wrong during that race -- I feel like I got pretty lucky,” Horn said. Horn had set a course record. No one had ever finished the race that fast before, and she was the first woman to cross the finish line first. "She pulled off the most fabulous race ever,” said endurance riding legend Darolyn Butler at Cypress Trails. "And the Mongolians loved Devan. She was their hero. I mean they couldn't get enough of this kid. And so when she lost it because of the pulse thing they refused to acknowledge it, and she was their winner and will be forever I think." Horn, who starts her senior year at SHSU as a Criminal Justice major next week, said she hasn’t yet decided if this will be her only attempt at winning the derby. "I can't fathom doing this again right now. I think that will change though and I have a feeling that I'll end up back in Mongolia some day," Horn said. And she comes home to Texas with the ability to call herself among the best endurance riders in the world. 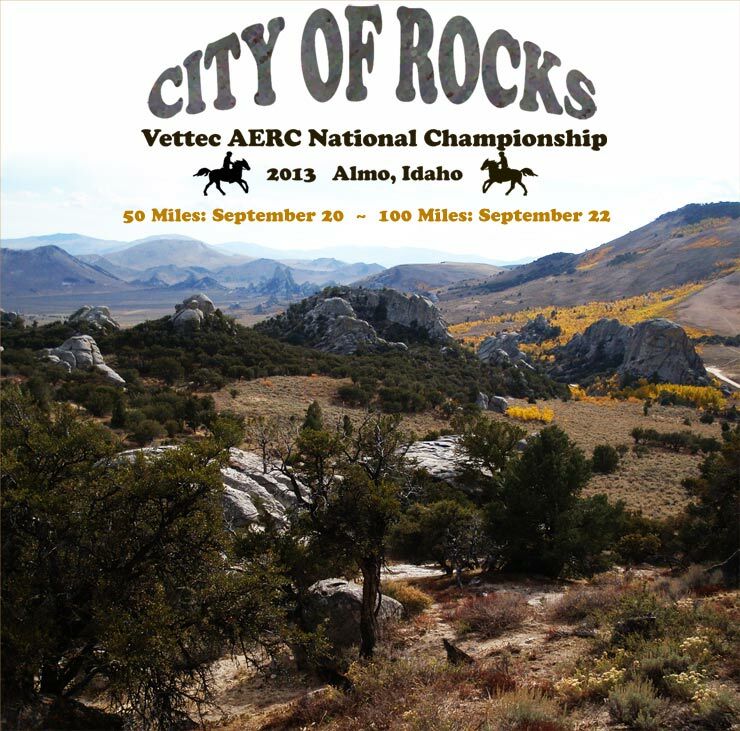 Entry forms for the 2013 Vettec AERC National Championships in Almo, Idaho on September 20 and 22 are now online. Deadline for qualification and entry is September 11. We need entries and payment by this date. Will refund all but $25 admin fee after this date. Meals will be provided by Two Trees Catering - good and healthy food! You must reserve dinners in advance to insure that we'll have enough food on hand. We will have hay for sale (really nice grass/alfalfa, certified weed free) but need to have advance orders. Corrals may be rented (12 x 12 stock panels) for $50 for the duration. These must be reserved in advance. If you're not riding, please consider coming out to help! This is a very big event and we'll need a lot of bodies for pulsing, timing, gate watch, cook's help, etc. Come and support our National Event - and let's show everybody how wonderful it can be here in Idaho and the Northwest! And you can bring horses for trail riding on Saturday between events. Christoph Schork of Global Endurance Training Center will be hosting a hoof care clinic on Saturday - shoes, boots, glue-on boots, glue-on shoes, trimming, all sorts of good info and drawings for prizes. Trail Maps are online now. (More changes are possible, but unlikely, barring crazy weather events and unforeseen circumstances). August 12, 2003, Texas ~ Devan Horn has just finished second – after coming in first in the longest and hardest horse race in the world – in Mongolia. Devan is 20 years old. What has shaped this fearless Action Hero? The back story shared by her parents, Rachel and Sandy Horn. “Let me say first that Devan NEVER walked. Her first steps at nine months old were at full throttle. This literally and figuratively set her pace regarding how she moves through the world. She was born with a will and tenacity that has my head doing 360’s several times a day. She had stitches and a missing front tooth by age two. Need I say more? Today's perimeter (yesterday's is the thick red line). There is now a voluntary evacuation for the few houses at Big Oak Flat off Mosquito Ridge Road to the SE of the fire. There's absolutely no access to the area south of the fire and the canyonsides are near vertical in places, so I hope this is just a precautionary thing and not an indication as to what they think will happen. I'm guessing the new fill in to the NW (Macedon Ridge) over to Deadwood Rd (very north end of DW Rd which runs along the west perimeter of the fire) was expected, but the growth to the NE was a big disappointment to them, as they hoped to hold it at Foresthill Road (photo taken from Sawtooth Ridge to the north of Foresthill Road: http://www.flickr.com/photos/yubanet/9535202340/in/photostream/). There were photos from two days ago from American Hill Rd (now vastly widened by bulldozer - suspect it was little more than a track prior to then) - http://www.flickr.com/photos/yubanet/9534271420/in/photostream/ - not sure if this is them setting backfires or if that's the forward front of the fire coming up the ridge. American Hill is the ridgelet ending where the "P" of Point in Pucker Point is. Unclear if they were successful in stopping slop over but from today's perimeter it would appear not - it has started down the east flank of the ridge. 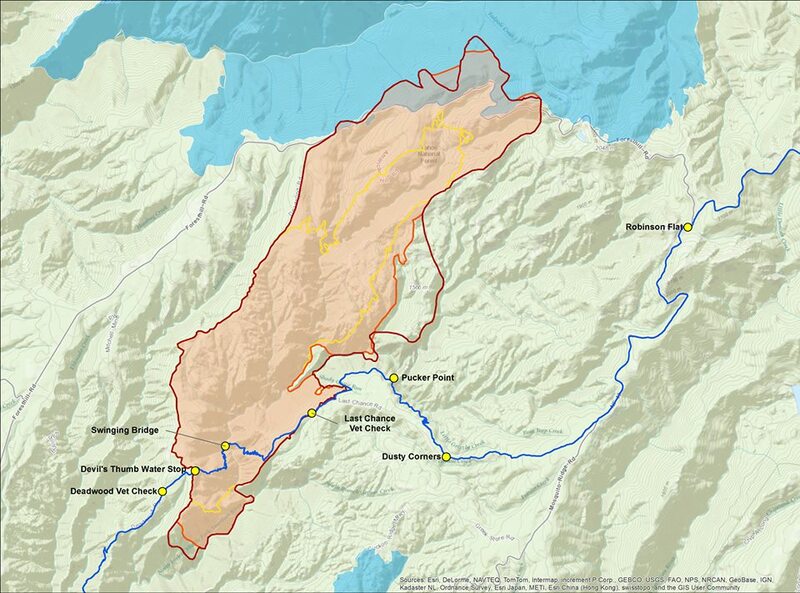 Looking at this map, my sense is that it could go up Screwauger Canyon (that large canyon that runs NE to the "R" in Robinson Flat, and possibly fill in the whole area between there and Foresthill Road. There's a bit more access to the area south of there - Barney Cavanaugh Ridge (where the Tevis Trail used to be routed until it go so rocky), so hopefully they can slow it there? New Trailer for "Arabian Silk"
The Virginia City 100 mile ride is coming up on September 21, 2013. The documentary, "Arabian Silk: Horses of Endurance" revolves around this ride. Here is a new trailer for the movie http://youtu.be/FIXlNsNi32g. When ordering your DVD, just mention AERC, and $8.00 per DVD will be donated to the organization. For more info please visit www.arabiansilk.com. The Staff of Darolyn Butler's Cypress Trails Equestrian Center will be appearing with Call of the Wildman's very own TURTLE MAN on ANIMAL PLANET on August 18th, 9 PM. Cypress Trails is at the first part of the segment. Watch TURTLE MAN and learn to ride CYPRESS TRAILS STYLE. August 16, 2013, California ~ In order to be a writer, you must have a story to tell. Devan Horn at age 20 is racking up the stories for an epic adventure novel. The latest is her race across Mongolia on semi-wild Steppe horses. Although Horn arrived in first place, because of a time penalty, her final finish order was second. This is her first public comment after her return. Take Action Now Against Cuts to Recreational Trail Programs! The American Horse Council is urging all recreational riders to call their senators and ask them to vote no on Senate Amendment 1742 to the 2014 transportation appropriations bill. Sen. Rand Paul (R-KY) introduced the amendment to the Transportation, Housing and Urban Development, and Related Agencies Appropriations Act. The amendment would strip all funding from the Recreational Trail Program. The Paul amendment would transfer all funding from the Transportation Alternatives Program to pay for bridge repairs. As part of the Transportation Alternatives Program,RTP would lose all funding in fiscal year 2014 if the amendment passes. Since its inception, RTP has provided money for thousands of state and local trail projects across the country, including many that benefit equestrians. RTP provides funding directly to states for recreational trails and trail-related facilities for all recreational trail users. It is funded with a portion of the gas taxes paid into the Highway Trust Fund by recreational off-highway vehicle users. Contact our Senators and express the importance of the RTP program to trails and rural economic development: EVEN 10 CALLS OR EMAILS CAN MAKE A DIFFERENCE TO A SENATOR! WILL YOU BE ONE OF THEM? A locally bred gelding, Remy (aka khnight to Remember) has once again completed the grueling 100-mile, 24-hour endurance ride, the Tevis Cup, at the age of 161⁄2. Known as “the toughest endurance ride in the world,” Remy and his owner⁄rider Peter Claydon of Buellton came in 16th place out of 160 starters, despite having had a fall on a precipitous mountain trail. The ride, which has been held annually since 1955, took place July 20. The temperature in some places reached 110 degrees over a trail that covered more than 4,000 feet of elevation changes in the High Sierras. Only 75 horses actually finished the ride. The American Fire, located about 10 miles northeast of Foresthill in the Tahoe National Forest, has burned across the North Fork Middle Fork American River and is burning both up and down the river drainage. The potential for fire growth is high due to the heavy fuels, steep slopes (up to 150 percent or 56.31 degrees), predicted temperatures, and low humidities. 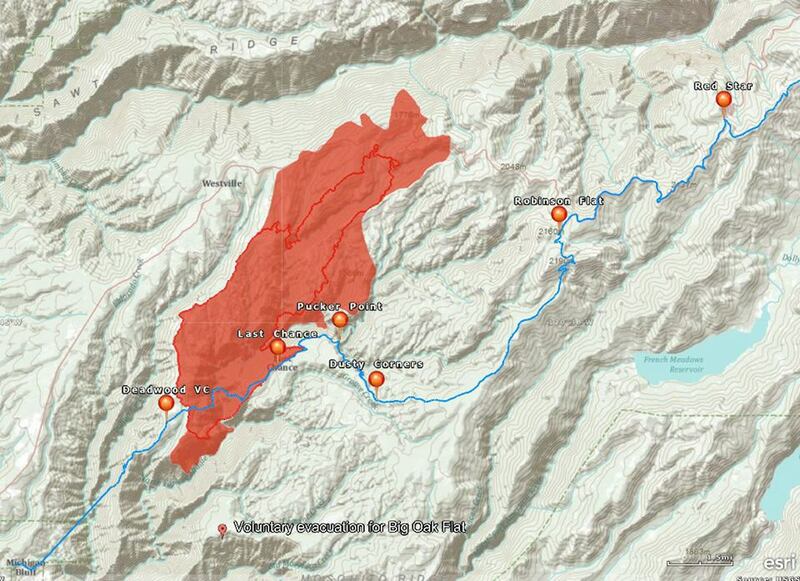 As of August 16 the fire has burned 7367 acres and is 35% contained. The community of Foresthill is not currently threatened. fire perimeter today (courtesy of Steve Willer, Premier Mapping) with Yubanet heat information (Red = intense head; yellow = scatterered heat; Red hotspots) superimposed over the WST. 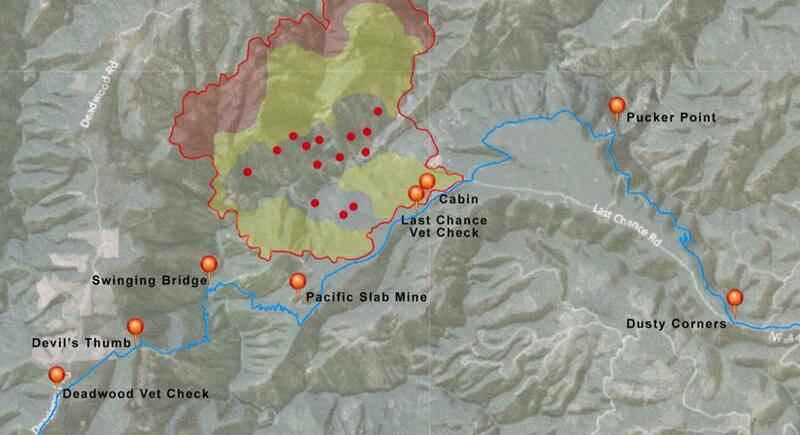 It looks like the fire reached all the way to the cabin near the vet check at Last Chance, and is still veering towards Pacific Slab/Swinging Bridge, but the majority of the new burn is focused to the north. The seventh annual Ride between the Rivers Endurance Race was a big success. On Aug. 3, the Randolph County Regional Riding Club hosted 70 riders for a nationally sanctioned 30- and 50-mile endurance race in Ellamore. The event has earned a reputation as one of the best in the country for challenging trails, beautiful scenery and most importantly, the spectacular volunteers. Each year, event organizers receive numerous accolades about the hospitality and professional management of the event. Tuesday was the first Endurance Day on Horses in the Morning at the Horse Radio Network. It was a live show from 6 to 7:30 a.m, co-hosted by endurance rider Karen Chaton. A wide variety of topics were covered, with guests Sue Hedgecock, Diedre from Action Rider Tack and endurance competitor Patti Stedman telling the crew about everything from riding in the dark to camping at competitions to putting your bridle in the dishwasher! Quote of the Month from “At the Waterhole/Greener Pastures” in our August issue. The breed recently lost an inspiring equine hero, who, despite living with a severe birth defect, was a champion in endurance. Parker AES (Hennessy x Cryztalgara) with Canadian Lee Hutten at the 2012 Biltmore Challenge, where they finished the 75-mile course in fourth place and won the FEI CEI Junior rider division and BC. Photo by Genie Stewart-Spears. 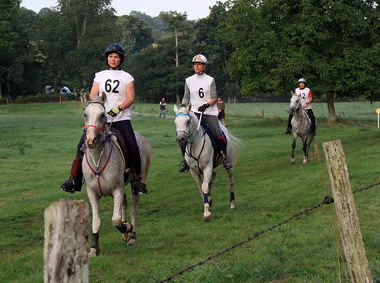 EVANSTON — Coming up on Aug. 16-18 will be the annual Pioneer Endurance Ride near Evanston. Organized by Beth Buzis of Bear River, this ride will be the third annual one in the area. It is part of the larger Northern Endurance Rider Conference circuit. This ride is a “pioneer” ride because of its three day length. Any ride in the circuit that is three or more days qualifies as pioneer mileage and goes into scoring for a special award in the NERC. The first two years the Buzis’ put on the race, it was held near Mountain View. They chose to change the location for this year’s race to Evanston for a few reasons. Need more info.? Email me at Appalucie at aol.com. I'll see you there! Being held in the Midwest, the centralized location will be easily accessible by a large geographical cohort of distance enthusiasts. Anticipating a large turnout, and good times! This is less than 3 months way (where is the time going!?) and there will be a raffle to assist in the funding of this premier event. We are looking for new/unused items that would appeal to the distance rider, the horses involved, the crew and interested family members that support their distance rider & horse. The possibilities are endless. Tack, horse clothing, rider items, horse feed/supplements/treats, crew items (outcheck bags, coolers with beverages/nonperishable snack items, inclement weather gear, shade tents), accessories for rigs (awnings/high & spring ties, bucket holders), horse containment (pickets, electric fence components) , buckets & hay nets, horse/distance rider themed items, photo sessions, certificates to future rides, gift certificates to the legions of distance rider stores . And mail/online order outlets....do you have a good working relationship with a favorite? Ask if they’ll donate an item or certificate good at their online store! A local feed store could donate a sack of feed, treats and/or supplements! And gas cards!!! Your favorite fill up station, if it a nationally recognized chain! I’m going to email BP (and remind them of what a volume-wise good customer I am) and request a donated fuel card! So I’m kicking it off with an item that my friends on Facebook helped me win by virtue of “liking” Distance Depot/The Horse Lover’s Outlet Facebook page on my behalf...this nifty bridle. As I am blessed to be the coordinator of this raffle, I’d be delighted to collect your donations at any ride I am at, or you can have it mailed to me or Jennifer Allen or Marge Spotts Dixon. 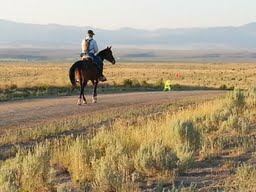 Lee Pearce's Fire Mt Malabar reached a career-high 4000 AERC miles on Day 2 of the City of Rocks Pioneer Trails endurance ride near Almo, Idaho over August 6-10, 2013. In addition, Pearce and Malabar received the Best Condition award. It is their 32nd Best Condition award together since 14-year-old Malabar began his endurance career 7 years ago. Starting on August 13, 2013 the Horse Radio Network is going to have a once a month Horses in the Morning radio show on the topic of Endurance Riding with your truly as one of the hosts, along with Glenn the Geek. The show is live on East coast time from 9:00 a.m. to 10:30 a.m. (6:00 a.m. to 9:30 a.m. West Coast). The Endurance Riding monthly show will air on the second Tuesday of each month. This is going to be a lot of fun and will be a great way for other equestrians to learn about the sport of endurance riding. We’re going to have guests on each show that will be both entertaining and educational. Just think about all of the interesting things we can talk about – horses, trails, tack, product reviews, useful tips, organization, travel, books and so much more!! Got some ideas for topics or guests? If so shoot me a message or leave a comment. Since the show is live callers are encouraged to call in and ask questions. When it comes to riding horses, Paige Taylor is in it for the long haul. The George Rogers Clark High School junior has logged more than 1,200 miles on the endurance trail since she began riding with her grandmother Janice Taylor in 2005. The younger Taylor is featured on this month’s cover of Endurance News and has competed in three events this year with Titan Missel, an arabian gelding. She began her riding career with Panama Jack, followed by a stint with a friend’s horse — Mr. Breeze. She competed with BF Suliemon before settling down with Titan. Moore was the only rider this year to complete the prestigious race riding a stallion. She finished 49th out of 161 riders (less than half of whom completed the race in the required 24 hours.) She started out at 5:30 A.M. on the 20th of July and rode through the night completing the race at 4:21 in the morning. Although the tradition of the Tevis Cup started with a Wendell Robie and his Arabian stallion Bandos, stallions entering the race are relatively rare. Even rarer are those that finish. This year Moore and DB Bey Barz were the only pair to succeed.